While the name of the author John Mortimer may not ring a bell, the name of his best known character, Rumpole of the Bailey certainly may. A lawyer himself, Mortimer has been writing since the late forties, both novels and plays. His most famous work for the stage is The Dock Brief which the London Times described as "A perfect jewel of a play". Nearly all Mortimer's best known works are short, perhaps because he trained writing plays for radio and television where the normal length is half-an-hour to an hour. As a result, his works are usually presented as double-bills and Bermondsey is no exception. It comes from a quartet of four short plays entitled Come As You Are, set in London with characters from different levels of society. As with so much of Mortimer's writing, the comedy of the situation he creates tempers the circumstances in which the characters find themselves. "Comedy is, to my mind," Mortimer has said, "the only thing worth writing in this despairing age, providing it is comedy which is truly on the side of the lonely, the neglected and unsuccessful." In Bermondsey, he shows us that love knows no boundaries, and often travels incognito. Jean-Paul Sartre was France's foremost post-war playwright, and to most Americans his name means Existentialism. Unlike his most famous play, No Exit, which premiered a year earlier, The Respectful Prostitute is a clear, direct, character-driven play, an indictment of American racism. Sartre's play came to Broadway in the late 40's and was about 20 years ahead of its time... at least for what some Americans were willing to hear about themselves. 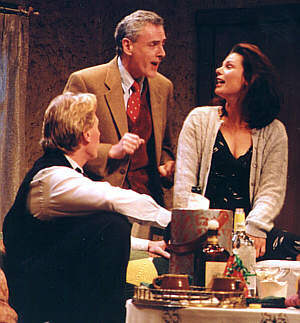 Despite opening to rave reviews in New York, the play was banned by police authorities in Chicago. But the entire community rose up to put on a protest performance of the play, and the censors were the ones ultimately silenced. Sartre was offering his own "severe truths" about our society, and if there is any doubt that the theme is dated or lacks resonance with today's audience, the recent events in Jasper, Texas sadly put that to rest. This double-bill was the first production under the new Bluestone banner. Cara Watson directed Bermondsey and Sean Hannon directed The Respectful Prostitute. They were originally planned as workshop productions for presentation at the Bluestone Barn and were performed there for two weekends in late August, 1998. The reception was so so good, the decision was made to restage them at the Schoolhouse Theater in Bluestone's November slot. There were cast changes between the two presentations. In Bermondsey, at the Bluestone Barn, Angus Hepburn played Bob, Peter Frost played Pip and Elizabeth Tryon played Rosemary. At the Schoolhouse, Angus Hepburn played Pip, Eric Teitel played Bob and Tracy Lane played Rosemary. Deborah Clifford played Iris in both versions. 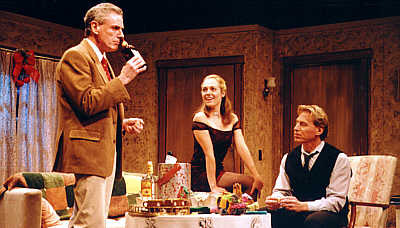 In The Respectful Prostitute, Peter Frost played Fred at the Bluestone barn while Eric Teitel played the role at the Schoolhouse. Production and rehearsal photographs, and cast lists are from the Schoolhouse production.